-or- Choose an icon from our Design Library. 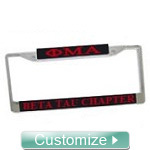 Customize your 10" x 7.5" car flag with the image, fraternity letters, sorority symbols, or chapter information of your choice. Personalize yours however you want. Product includes attachment for car window. NOTE: Since this is a custom product, we will email you a proof after you complete your order. Turnaround time is 5-10business days after design approval.